Hey everybody! The Strang Institute is going to be closed the rest of the week for the 4th of July holiday here in the U.S. So, alas, no new comic on Thursday. I know, I know. 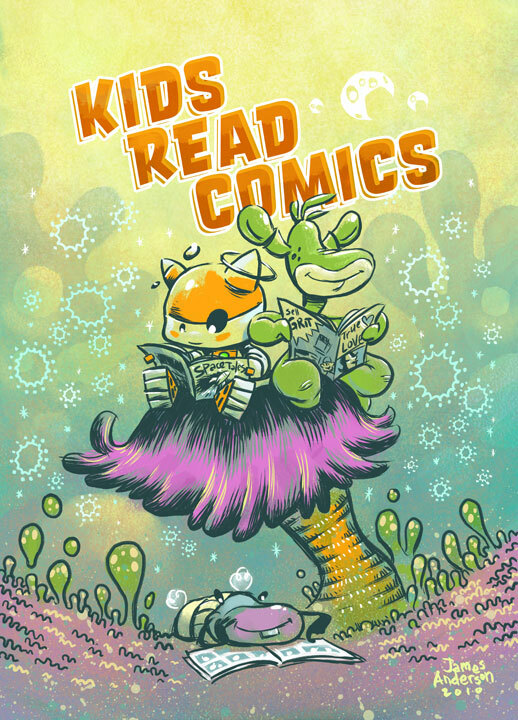 To make up for that, here’s a poster I did a few years back for Kids Read Comics, the event I’m attending this Saturday and Sunday in Ann Arbor, Michigan. Jeff was green. Muffin’s nose was pink. How weird is that? Check back though. I may still be able to sneak into Mission Control and post a few things between now and next Monday. See you then! The non-standard colors on Jeff and Muffin isn’t what stands out as most unusual – it’s that Muffin is SMILING! How often do we get to see that? That must be some awesome comic he’s reading! Looks like Muffin’s happy place must definitely have comics to read there. I love the orange & teal limited palette, but man, this is perty!